I just returned from spending a month in the UK. My husband and I attended a family wedding (steampunk! ), but while in Britain I wanted to meet as many polymer clayers as possible. I looked at our schedule and then contacted several British polymer clay guilds and groups. As it turns out, schedules coincided and several groups welcomed us with open arms. Here’s more about each visit. Our first stop in the UK was at ClayAround, an online polymer clay shop in Wales run by Penny Vingoe. We met and stayed with Penny during our UK visit two years ago and I eagerly returned for another visit. At my request, Penny arranged an impromptu Clay Day. I gave a talk about translucent polymer clay to the small but eager group. I then spent lots of time talking clay with everyone as the day went on. I even did a bit of claying myself! If you’re in the UK, ClayAround is one of the best sources for all things polymer clay. I had great fun exploring Penny’s shop and looking for things to buy. In addition to all major polymer clay brands, ClayAround carries an incredible array of tools, textures, paints, inks, and MUCH more. I brought home a nice little haul and even got some really nice silkscreens that you’ll see in an upcoming article. If you’re in the West Midlands or in Central to North Wales, consider coming to one of Penny’s Clay Days. This is an eager bunch of really creative clayers who readily share ideas and help each other learn. It’s an excellent community. You can read about Welsh Clay Days here. 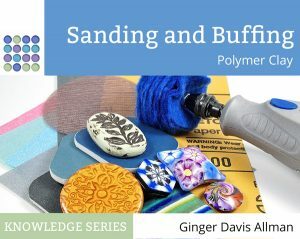 Do check out the fantastic polymer clay resource that Penny has compiled. It’s called Community ClayAround. I sometimes participate in discussions on the London Polymer Clay Group’s Facebook page and therefore already knew several of the members. So I was really quite eager to drop in for a visit. When Ann Parker, the guild’s Events Organizer, found that I was coming, she graciously invited my husband and me to stay with her and her lovely family the night before the meeting. London can be difficult to navigate, so I was quite happy to go along with her to the meeting. The London Polymer Clay Group meets in a community center in Central London near Marylebone Station. Started in 2007 by polymer artist and author Carol Blackburn, this is a large group, made up of clayers from professional to beginner from all walks of life. A demo program had been scheduled for the day of the meeting, but the presenter had a family emergency and couldn’t attend. So Carol Blackburn and I pitched in to give talks and demos. Carol shared a neat method for making spacer beads from leftover scrap and I talked about translucent polymer clay and demonstrated a way to use crumbly translucent clay. As it turns out, this meeting was the 9th birthday of the group’s founding. Birthdays need cakes, and so Ann and Jude Parker made one. You might be interested to note that the cake was decorated with fondant made using a (food-dedicated) pasta machine. Jude made gorgeous Skinner blends with the fondant and decorated the cake in pinwheels. Isn’t it great? Even though everyone was busy creating, we did get a chance to gather outside for a group photo. Look at all those smiling faces! I really enjoyed the day with the London Polymer Clay Group and found there just wasn’t enough time to talk to everyone. So many great ideas shared and exchanged! There are two main British polymer clay guilds and groups. 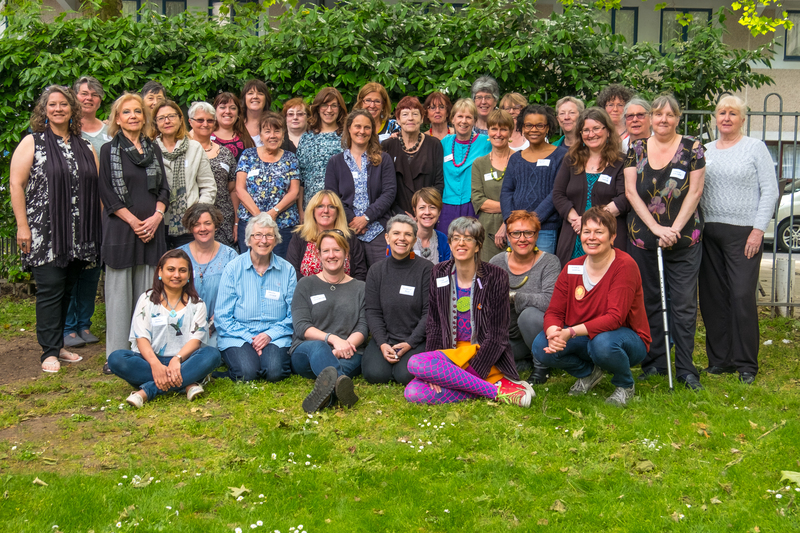 The London Group is one, and the British Polymer Clay Guild is another. The BCPG is actually a cluster of guilds and regional groups. One of these is the East Midlands Polymer Clayground, founded by Sue Corrie. When we visited this guild, we were graciously hosted by Dianne Phillips and given royal guest treatment. Dianne and Sue filled us in on the history of the guild and told us about the Long Eaton Art Room, where meetings are held. It is a community art center that houses artists’s studios and provides artistic care to disadvantaged community members. The East Midlands guild meets in Long Eaton, which is near Nottingham, in the north-central region of England. It’s a small but cozy group of people who love getting together to share and talk and socialize while they work on their polymer clay projects. The guild also holds regular workshops and learning events as well. I had a lovely day with this group and really enjoyed lots of conversation, both about polymer and much more. I did give a short talk on translucent polymer clay, but mostly we just enjoyed the day with this welcoming group. All too soon the day was over and we had to head to the next adventure. The British Polymer Clay Guild is a collection of smaller regional guilds and groups that meet all over England. The guild itself has been somewhat in a state of flux and members are working hard to give this collection of British polymer clay guilds and groups new direction and focus, making it even better than before. Committee Member Lizzi Bucklow-Holt (the artist behind Bizzi Zizzi and Peace Pebbles) came to the meeting with the East Midlands guild and invited me to join her for an interview. You can see that interview, recorded live, here. Are you looking for local British polymer clay guilds and groups? Have a look at the list of regional guilds and groups here, and see if there is an existing one in your area. Joining guilds and groups are a fantastic way of meeting new people, learning about polymer clay, and being part of the claying community. You might think you need to be an experienced clayer, but every guild is open to all experience levels from professional to “just bought my first package”. You’ll love the camaraderie and the wonderful influx of new ideas that comes from sharing with others. I want to take a moment to thank the members of these guilds and groups for being so welcoming to me and my husband during our visits. You all made us feel right at home and immediately part of things. Special thanks to Penny Vingoe, Ann Parker, and Dianne Phillips for opening their homes to use and sharing meals. And of course much gratitude goes to Carol Blackburn and Sue Corrie for giving me the opportunity to speak to these groups! Thank you all! Looks like everyone had a great time…. I think so. Everyone was so welcoming.